I have been thinking about this for decades: see and hopefully image all the planets of our Solar System in one night, from sunset to dawn. And I did it, last night, in a very special way: I imaged all of them from Rome, including amazing monuments of the Eternal City in my images. It was hard, but it was fun! 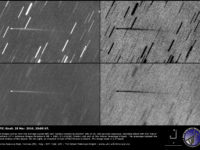 Spying the entire planetary family in one night is not straightforward. You need that all the planets are far enough from the Sun, away from its intense light, but this happens, from time to time. In the past, I succeeded observing and imaging the five naked eye planets at a glance, when they offered a great view in 2016. 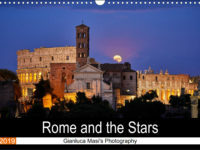 Again, earlier this month, I could capture four of them, crossing the starry catwalk above Rome, missing Mercury, but with the Moon as a nice bonus. Of course, the Earth on the foreground qualified as a planet, too. Since Pluto got demoted from being considered a planet in 2006, the remaining planets can be visible even with a very modest binocular, being bright enough. In short, the official, current eight planets of our Solar System are available for a wonderful grand-tour, if you carefully choose the right moment, weather included. And these days are just perfect! While four naked eye planets were on air already, with Venus leaving the evening sky pretty soon, I had to wait for Mercury to show at dawn. But we also have Uranus and Neptune out there this time of the year. 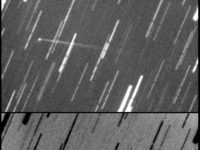 Looking at their position in the sky, we see that these two very slow objects are among the typical Autumn stars (for those living in the Northern hemisphere), a season we are approaching, with its stars visible in the middle of the night. In short, once Mercury was ready at dawn, everything was set to try this journey. 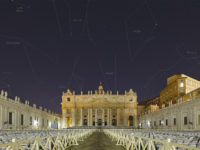 I was ready to go, but in a special manner: instead of observing them in a plain way, I wanted to image them from Rome (not an easy location for Uranus and Neptune, being faint enough and difficult to see under severe light pollution), framing them with a monument of the Eternal City. Such a Solar System imaging Marathon was never done with this idea in mind, to my knowledge. I prepared my imaging gear, consisting in two Canon 5DmIV DSLR bodies and two lenses: a Canon EF 24-70mm f/2.8L II USM and a Canon EF 70-200mm f/2.8L IS II USM. Of course, I had a sturdy tripod to put all this on it. It was going to be a one-night-long task, considering that the planets were scattered across the sky from sunset to dawn. As Uranus and especially Neptune are faint to see from a big city, I had to carefully select the imaging location and the monuments to include in their pictures. 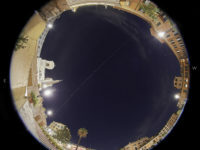 I studied this in depth, also considering my long time experience in imaging the sky from the city, selecting some very suitable places, both for the imaging conditions and the presence of a illustrious monument. With everything set and ready to go, I decided to go out there last evening, beginning this cosmic tour. The Moon was also going to show, adding to the planetary family in a nice way. Venus requires immediate action soon after sunset, as it leaves the sky soon now. Jupiter is not far from it, providing a great sight: two of the brightest celestial objects at a glance. 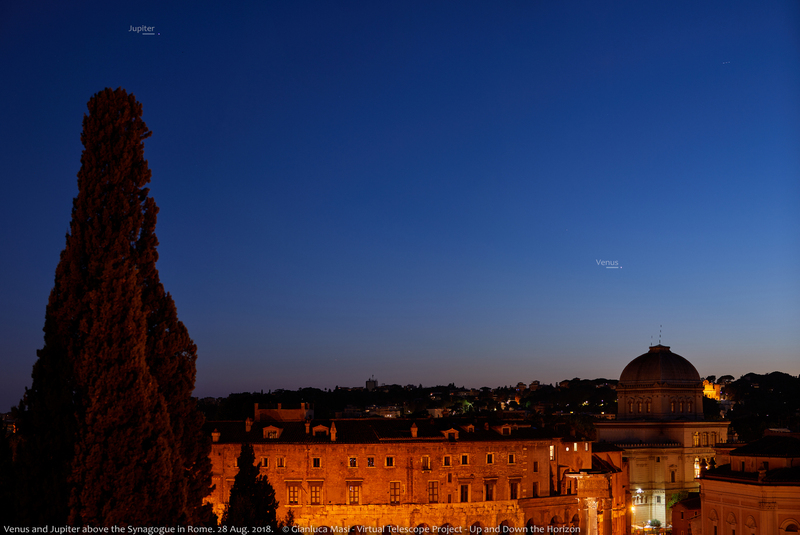 Below is the image showing both of them at evening’s twilight, above the Synagogue of Rome. Looking at them was amazing, with the colors of the sky rapidly changing, while the Sun was sinking deeper and deeper below the horizon. First two planets secured! Easily and safely, I would say. Then, I changed my location, bringing with me the heavy payload I mentioned above. I understand why people looked at me in such a curious way, asking themselves why I was bringing with me all that stuff, especially when they go around with their smartphones only! 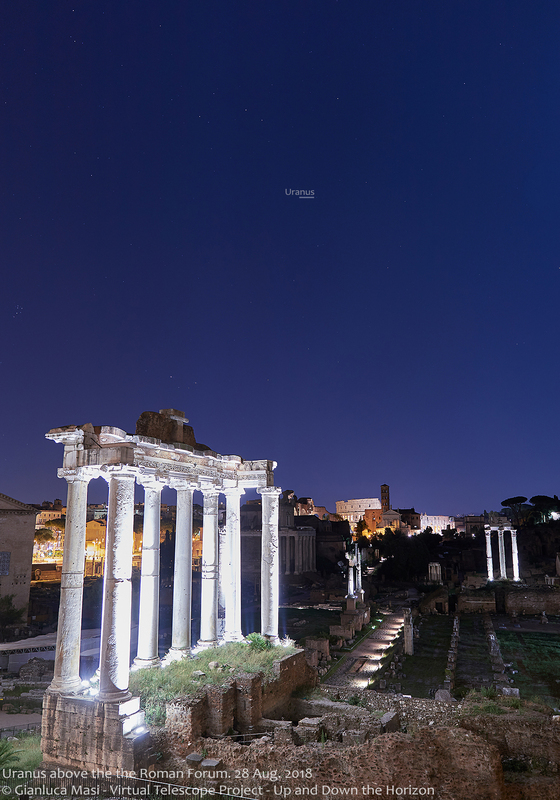 Next stop was the Roman Forum, to grab Saturn and Mars. 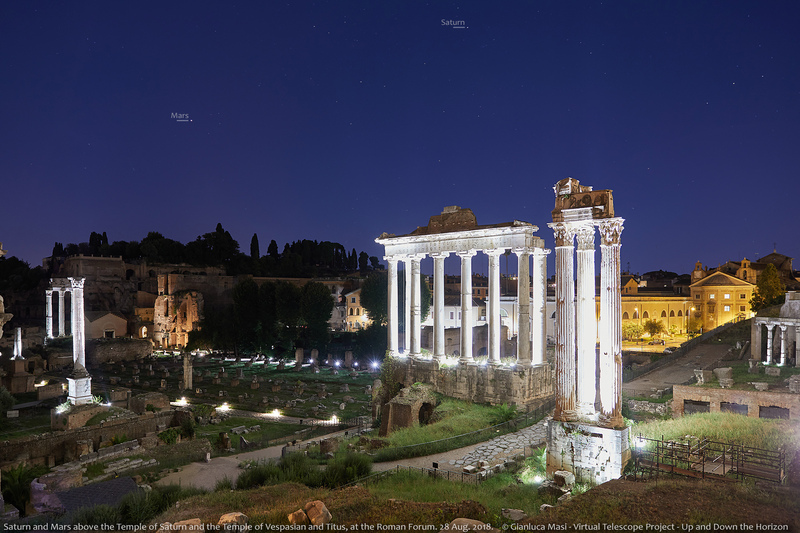 I managed to include the Temple of Saturn (how appropriate!) and the Temple of Vespasian and Titus in such a capture. Seeing this area at night s always breathtaking and having planets and stars above is mind-blowing. In a few minutes, under a dozen of curious far-East eyes, I was ready and started imaging. Below is what I could admire, hope you like it, too. I managed to average a few images, to get more stars visible: Scorpius and Sagittarius are very obvious to see, I’m very happy with these results. Of course, I enjoyed all this with my very own eyes: technology is great, but as humans we need to feed our five senses with beauty. Time to leave for another planet! The third stop was planned to capture Neptune, the farthest of the Eighth planets, hence the faintest. For the most difficult object, I wanted a legendary monument and luckily in Rome we have the immortal Colosseum. It was the gem of Rome I wanted in my picture of Neptune, despite the planet was going to be visible as a mere dot of very faint light. I took ten images, then I averaged them to increase the quality of the weak signal of Neptune and I must admit it worked very well. Below you can check and judge yourself. Neptune is at 4.3 billions of km from us, very faint (not visible with naked eye: about 200 times fainter than the Polar star), but visible, on the very right of the marker I placed on the image. I must admit I was amazed to see I could record it, really. That tiny light is the farthest, giant planet we know in our planetary system to date. 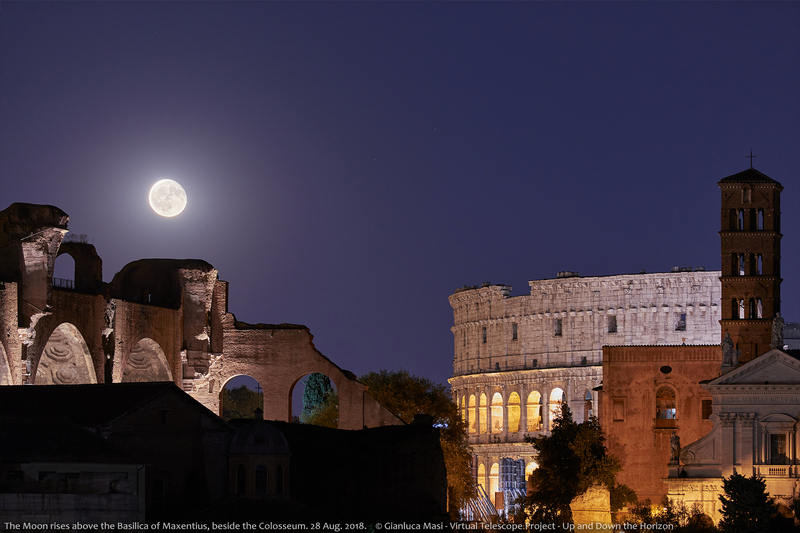 But I knew someone was going to enter the scenery and joining the trip: on the left of the picture above, you can see some glare, that is the Moon rising behind the Basilica of Maxentius. Switching to my other camera, with a longer lens and waiting for a while to have it perfectly placed, the Moon joined the tour in a great way. At this time, once done with the Moon, I had to wait for Uranus to climb the sky, so I took a little rest. It was really needed, I cannot tell you how much I walked. I remembered I had no dinner, so I did a ride to home to get some energy back, later going out again, under the stars. 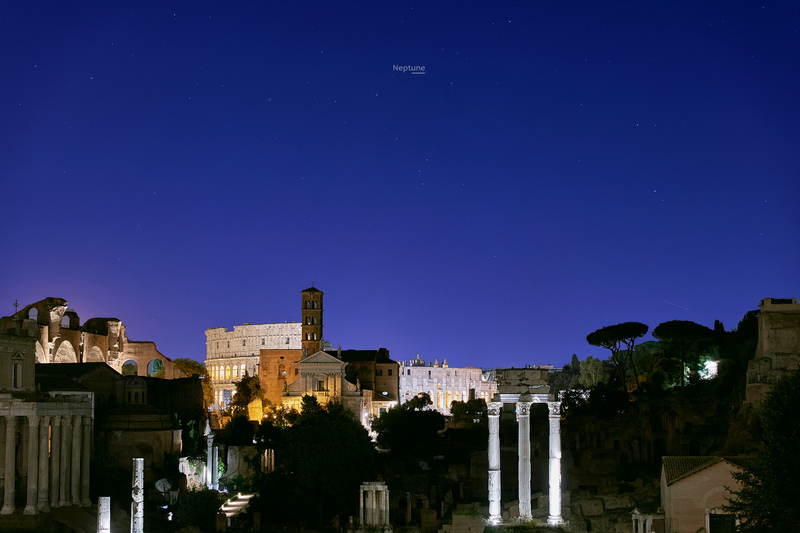 The location for Uranus was, again, the Roman Forum, where I studied this time a vertical image: I carefully included the small, but wonderful Pleiades open cluster, visible on the left of the image as a very small deeper. Uranus in marked and labelled for your convenience. This time, I averaged three images. Then, the only missing planet was Mercury. It was going to rise at dawn, so I decided to go home and have a couple of hours of sleeping. When the clock alarm shouted it was time to move, I quickly left home and drove to the Janiculum Hill, facing East, where I had to wait for Mercury. I was alone there, the temperature was 19 Celsius degrees… Summer will not last forever. 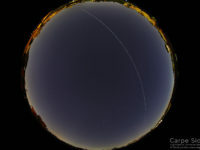 I started imaging when Mercury was just a few degrees above the horizon, while the twilight already started and I could see the planet in my images first, then I could see it by naked eye. 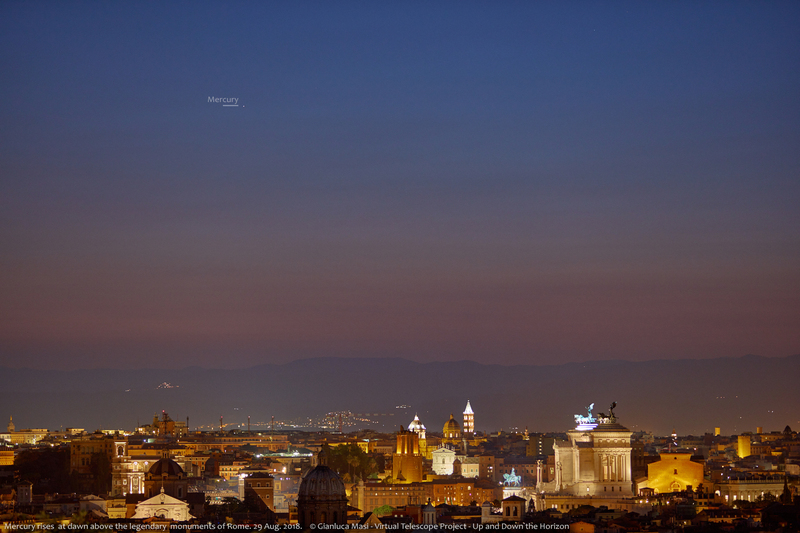 The panorama of Rome from there was honestly superb. At this point the grand-tour was over, I was very tired, but it was hard to leave, after such a journey. I traveled for billions of km, back and forth through our Solar System, spotting all its eighth planets (Earth included, as the foreground in my images!) and the Moon above some of the most precious monuments and symbols of our culture and history. I hope this long report was able to bring to you my experience and feelings and that your time used to read it was well spent. I can say that living this experience was amazing, one of those things leaving great memories and feeding our love for the Cosmos and Beauty. 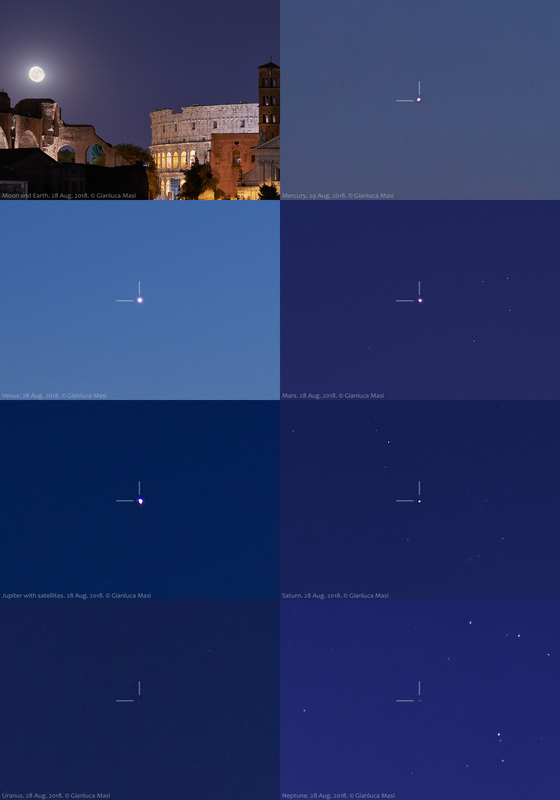 My friend Bob King wrote a nice article about seeing the eight planets, by the way, check it here! You have a few days left to do the same journey, go out and try. Good luck!